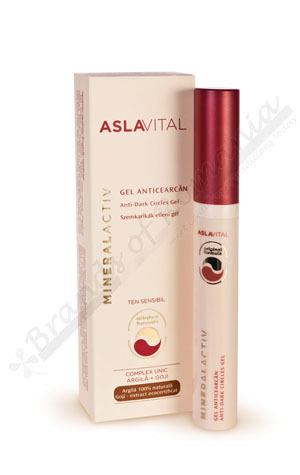 Anti-dark circles gel – 15 ml. A concentrated gel with corrective effect over dark circles. Anti-dark circles gel is a concentrated gel, rich in active principles, with repairing and corrective effect over dark circles and bags under the eyes. The unique complex of natural Clay and organic Goji Berry extract and the Ferulic Acid have powerful antioxidant, remineralising, and cellular energizing effects. The peptide complex has deep action and increases elasticity, firmness and density of the skin, improves periocular microcirculation, restoring the skin’s natural look. Apply in the morning and in the evening on the clean skin, around the eyes. Visible effects appear after 28 days of treatment, but to treat dark circles and bags under the eyes, use it at least 56 days.